Abstract film base class - used to store samples generated by Integrator implementations. To avoid lock-related bottlenecks when rendering with many cores, rendering threads first store results in an "image block", which is then committed to the film. Accumulate a bitmap on top of the radiance values stored in the film. Does the destination file already exist? 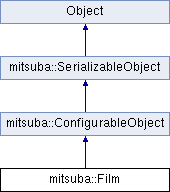 Develop the film and write the result to the previously specified filename. Develop the contents of a subregion of the film and store it inside the given bitmap. Return the offset of the crop window. Return the size of the crop window. Return the image reconstruction filter. Ignoring the crop window, return the resolution of the underlying sensor. Return whether or not this film records the alpha channel. Should regions slightly outside the image plane be sampled to improve the quality of the reconstruction at the edges? This only makes sense when reconstruction filters other than the box filter are used. Merge an image block into the film. Serialize this film to a binary data stream. Overwrite the film with the given bitmap and optionally multiply it by a scalar.